Make a splash at Canada’s largest indoor aquarium. Everything is awesome when you build lifelong memories together. Booking a Toronto vacation couldn’t be easier with Reserve Toronto. We’ve got the best deals on family-friendly attractions like the Ripley’s Aquarium Canada as well as LEGOLAND Discovery Centre and Wonderland. Likewise, visit one of the natural wonders of the world—Niagara Falls—on one of the many tours available. You can also reserve affordable hotels and resorts, making it easy for you to vacation in one of the most culturally diverse cities anywhere. Tripster Toronto coming soon! If you’ve never visited Canada, you’re missing out! The beauty of this country is on full display in Toronto. Located on the northwestern shore of Lake Ontario, this attractive metropolis is frequently described as “New York City run by the Swiss.” And for good reason! You can find world-class shopping and dining here as well as renowned entertainment. In fact, Toronto has the third largest English-speaking theater district. 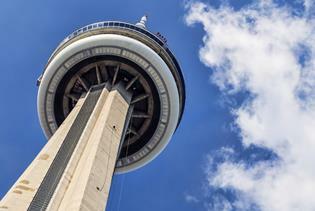 In addition, it’s also home to the CN Tower, the tallest freestanding structure in the western hemisphere. Plus, the people are so polite you’ll feel right at home in this bustling city. Toronto offers a vibrant mix of things to do, ranging from cultural pursuits to outdoor endeavors. This “City of Neighborhoods” boasts a Chinatown, Greek Town, Little Italy and Koreatown, among others, as well as premier museums like the Royal Ontario Museum and Art Gallery of Ontario. Vacationers here can also explore wildlife at the Toronto Zoo while shopping, dining and entertainment options are the draw of the historic Distillery District. Don’t forget to enjoy the natural side of Toronto, too. In addition to nearby Niagara Falls, Toronto has an abundance of green spaces including Kelso Conservation Area, Crawford Lake Indian Village and Hilton Falls. When you visit Toronto, it’s important to keep the seasons at the forefront of your plans. Generally, late spring, early summer and fall are ideal times to visit. In fact, September is probably the most pleasant of all. If you visit during the winter months, come prepared for chilly temps but don’t count on snow. Typically, it only snows 2-3 times a year. Whether you visit for a quick weekend or a leisurely week, Toronto hotels will suit your needs. From budget-friendly hotels to lux skyscraper suites, the perfect accommodations are waiting for you in Toronto. With Reserve Toronto, you can always rest assured you’re getting the guaranteed lowest rate too. And there are always free things to do in Toronto as well, so let’s pack and go!